Keeping a neat and organized desk can be a challenge for anyone. Thankfully, British designer (and one of our favorites), Samuel Wilkinson has created the perfect modular work space for Case Furniture Company called the Mantis Desk. The desk is made simply of steel and Beech wood, many of its components may be constructed or deconstructed depending on the owner's needs, and it fits perfectly in any home or office. Fresh off his British Design Museum, “2011 Design of the Year” win, Wilkinson’s latest Mantis desk is another crowd pleaser with its simple yet flexible design. The beech wood table top has a removable plate allowing easy access to the storage tray beneath, hiding and managing any loose wires and cables. Additional features include a removable drawer for a laptop or extra paperwork and a file holder to keep the space organized. A magnetic panel that can act both as a bulletin board or a privacy screen is also available. All accessories are optional and can be attached or rearranged in nearly any position. Wilkinson also power-coated each accessory in a textured off-white to highlight the natural patterns of the solid wood top. The table’s four steel legs are also detachable, making the entire workplace easy to store or even transport! This elegant, modular Mantis desk is also affordable, giving anyone the chance to enjoy their very own piece by an award winning and internationally exhibited designer. Fresh off his British Design Museum, "2011 Design of the Year" win, Wilkinson's latest Mantis desk is another crowd pleaser with its simple yet flexible design. 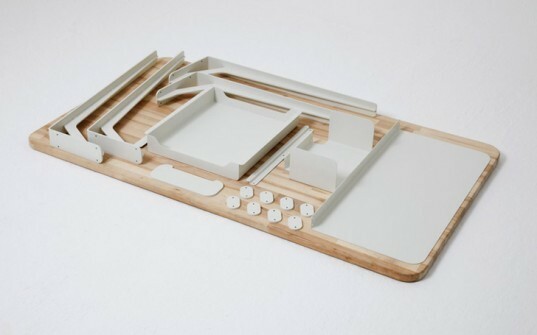 The beech wood table top has a removable plate allowing easy access to the storage tray beneath, hiding and managing any loose wires and cables. Additional features include a removable drawer for a laptop or extra paperwork and a file holder to keep the space organized. A magnetic panel that can act both as a bulletin board or a privacy screen is also available. All accessories are optional and can be attached or rearranged in nearly any position. Wilkinson also power-coated each accessory in a textured off-white to highlight the natural patterns of the solid wood top. 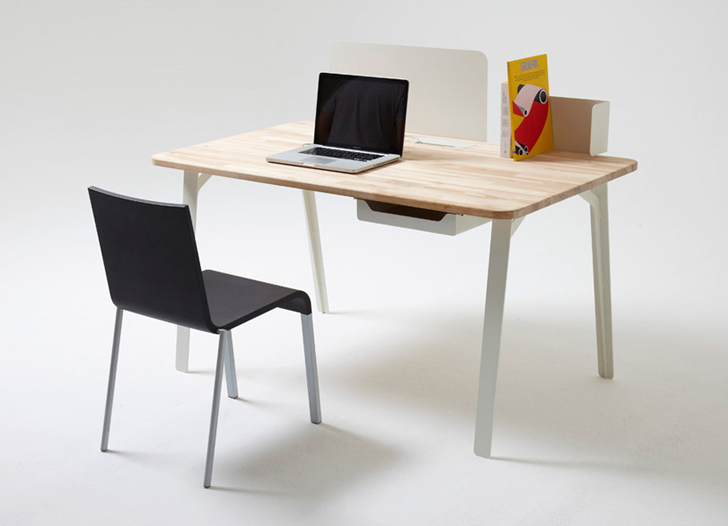 The table's four steel legs are also detachable, making the entire workplace easy to store or even transport! This elegant, modular Mantis desk is also affordable, giving anyone the chance to enjoy their very own piece by an award winning and internationally exhibited designer.